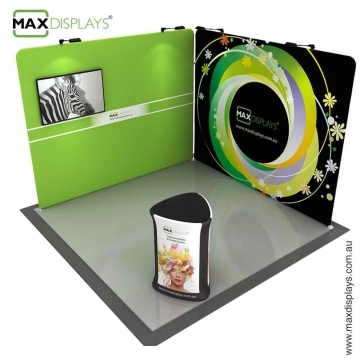 This pop up trade show package is the best option when you get a corner spot in an exhibition. It gives the flexibility to convert the 3 x 3 booth space to a 6 x 3 space. You can display the fabric wall in “L” shape or in a straight line. 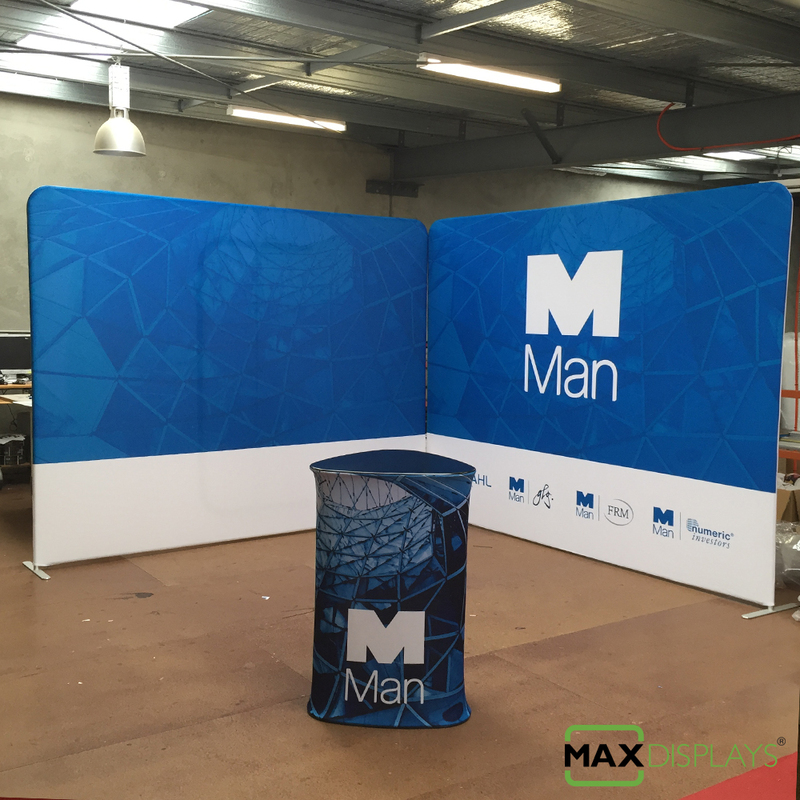 2 x Pop up wall 3m wide x 2.3m high. 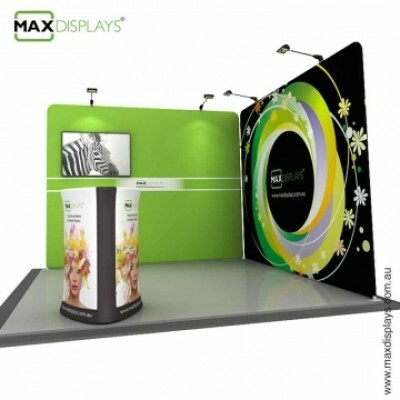 The pop up display wall can be placed flush with the exhibition partition. 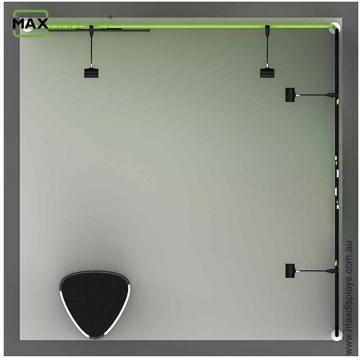 You save 350 – 400mm between the exhibition partition and the pop up wall. This gives you additional 2 Sq m floor area to move around. The pop up wall is completely printed onto fabric with Dye sublimation technology giving you the flexibility to machine-wash it if it gets dirty or dusty. 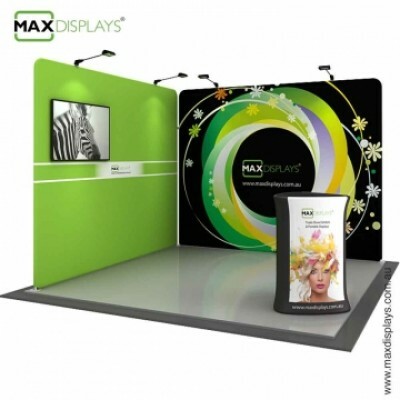 The printed fabric is wrinkle free giving you a smooth finish when setup with the frame. Installation of this package is a breeze, it takes less than 25 min to finish the complete installation. 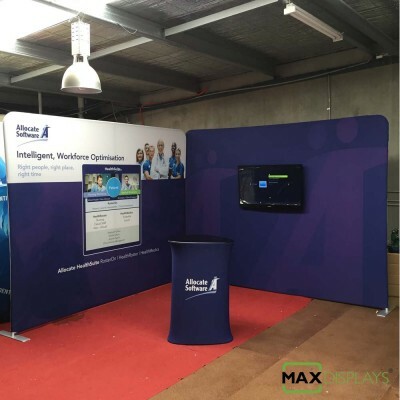 You just need to be bit earlier to setup your booth before the show starts, reaching just on the show date saves you hundreds of dollars from hotel stay spend for you and your marketing team. No tools required for installation. 1 x TV carry carton. They fit into a standard saloon car, you can take them with you when you fly interstate or overseas for trade shows.The weight of the complete unit including the TV is 46 Kg. You can have them with your own TV or without the TV or with 42” TV. Feel free to contact us on 02 9011 6785 for further information our dedicated sales team will be happy to guide you.